Beauty. Comfort. Ease. Weighing just 1.8 ounces, our light-weight Celeste Cotton Head Scarf for cancer patients allows your scalp to breathe, keeping you cool and comfortable any time of year. Soft , beautiful pre tied chemo scarves for women in high-quality cotton interlock with a touch of Lycra added is more substantial than your standard T shirt fabric. Our top pick in cancer headwear for yoga, exercise or casual wear. We offer an array of solid colors to compliment any complexion. Easy, no-fuss pre tied chemo headscarves , ready to go in seconds. A strip of soft elastic across the neckline creates artful gathers and allows for a secure fit for head sizes 21"-24" as measured around the hair line. 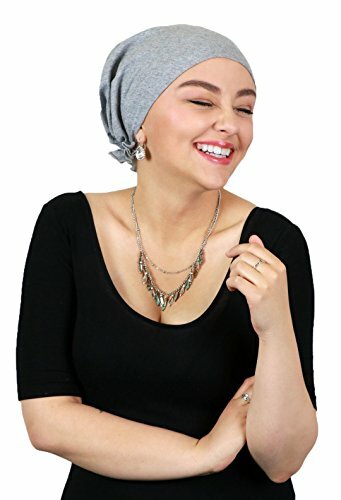 A great chemo headwear option for women with large heads. Two 7" ties on either side give you several styling options. Leave loose, tie in a knot or tuck inside to create the look you want. A unique feature in a pre tied cancer scarf. Perfectly soft and comfortable on a bald head. This unique design absolutely will not slip. No liner or uncomfortable scarf gripper needed. Also makes beautiful head coverings for women who choose to wear a headscarf for modesty. Highly recommended for women and teens with sensitive heads as a soft and comfortable wig alternative for your cancer headwear options. Hand wash, air dry. Hand crafted with care in the USA. If you have any questions about this product by Hats Scarves & More, contact us by completing and submitting the form below. If you are looking for a specif part number, please include it with your message.